Huge Sale. 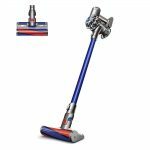 Newegg.com has a Dirt Devil Reconditioned Jaguar Pet Bagless Upright Vacuum Sale, $13.99 after $10 mail in rebate, Free Shipping. Expires Soon - $67 at amazon when New.